Many communities are interested in becoming more pedestrian-friendly. Older adults are one segment of the community who need to have the option to walk for errands, health benefits, socializing and other purposes. However, older pedestrians are at greater risk of injury or death than many other age groups. There are things that seniors and the communities where they live can do to make it safer and this workshop aims to inform seniors, community leaders and professionals of potential solutions and inspire action. 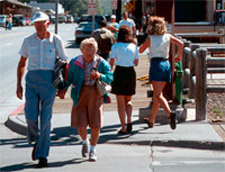 Developed by the University of North Carolina Highway Safety Research Center for the National Highway Traffic Safety Administration, the Pedestrian Safety Workshop: A Focus on Older Adults engages communities in addressing the pedestrian safety issues that older adults face and provides strategies for safer walking. The workshop is designed to advance the process of creating more pedestrian friendly environments by both encouraging dialogue among a variety of community members and equipping participants with ideas to improve walkability in their community. Likely participants include older adults and other interested community members, transportation planners and engineers, public health professionals, law enforcement officers, senior center staff, elected officials, business owners and others who have an interest in safety, health of older adults, physical activity promotion, transportation or walking. The Workshop ideally convenes a group and an instructor together in the same room. This web-based format is intended to support in-person trainings when possible but also offers a way for individuals and groups to access the workshop content without setting up an in-person experience. NHTSA aims to save lives, prevent injuries and reduce economic costs due to road traffic crashes, through education, research, safety standards and enforcement activity. NHTSA's support for this workshop is based on their intent to reduce the number of pedestrian injuries and fatalities.